For anyone with a busy schedule, that regimented diet – you know, the one that sounded so simple to stick to on January 1 – can start to feel impossible by February. What if you don’t have a lot of time or money to spend on an eating plan that requires long trips to the grocery store followed by hours of meal preparation for the week ahead? Meet your new backup plan over at Smoothie King. 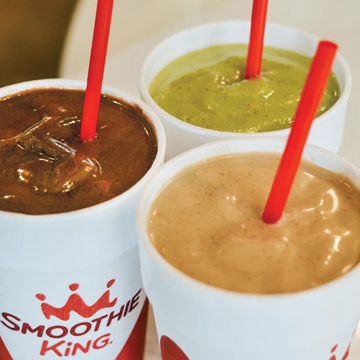 We’ve been blending Smoothies with a Purpose since 1973 and we are so excited to be your new neighbor! Whether you want to slim down, get fit, or just eat more nutritiously, we make healthy eating simple by offering made-to-order smoothies with real ingredients in a quick-serve environment. Breeze through our drive thru at breakfast for a coffee smoothie containing 30 g of protein or a Greek yogurt smoothie made with fruit, protein, and fiber. Instead of another overstuffed sandwich for lunch at the office, team with your coworkers to hold one another accountable for your goals by calling ahead for meal replacement smoothies and we’ll have your order ready when you arrive. Rethink your nutrition and refresh your resolutions by making one simple change that’s fast, easy, and doesn’t taste like health food. We’re here for you and can’t wait to serve you!